If you grew up during the era in which waking up early Saturday mornings was worth it for the cartoons, chances are you saw a lot of the same commercials we did. Some of these, with their cheesy 80s graphics and catchy jingles, have stayed close to our hearts forever. Others you have forgotten, but you will instantly remember when you see them again. For your viewing pleasure, here are seven memorable junk food commercials. What exactly are they doing to his chair? Who didn’t want to challenge the smug announcer’s bold statement that “there’s no wrong way to eat a Reese’s”? I didn’t know who the domino champion or race car driver were, but I knew they must be cool because of their candy choice. Those with the memory of a champion will remember the Halloween Reese’s ads, featuring a vampire leaving trademark tooth imprints on the delicious chocolate cup. They sure knew how to market something that was essentially a re-hash of Kaboom cereal. Weird Al missed the boat on parodying this song, so the cereal jingle writers were next in line to get the offer. The Ghostbusters cereal commercial feels like a 1950s advertising agency stepped into a portal that took them to 1984. 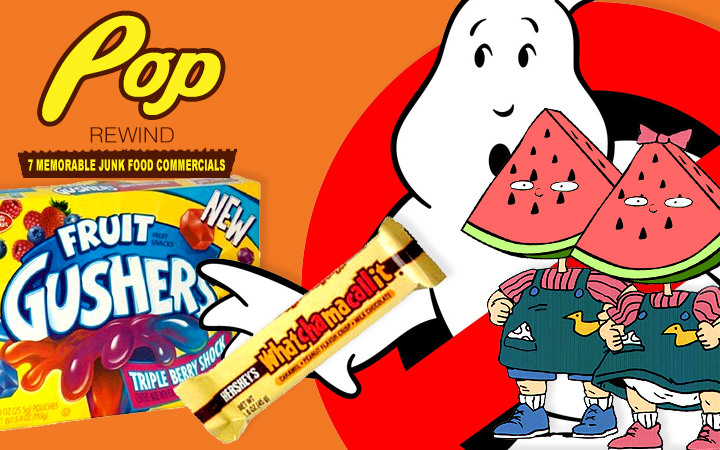 It features campy kids chanting “Tastes real good!”, along with a ghost that appears more cute than scary. Take extreme comfort in knowing that this cereal, and many future franchise tie-in cereals, was made by a dog food company. The 80s were big on using every method of animation available at the time, and this classic Fruit Stripe Gum commercial does not disappoint. A cartoon interacts with a live-action kid while a computer generated bubble bursts in his face. The zebra hops aboard his motorcycle, crosses some stop motion road, then ends up in claymation territory! This commercial proves “action packed” can clearly apply to a thirty second piece. Where can I find that way rad hat? I still feel a little disappointed that I wasn’t in this commercial. All the actors appear to be having a great time hanging out and eating candy. The song is so catchy that it’s hard to believe thirty seconds have passed by the end of the commercial. Keep an eye out for that Casio-inspired combination drum machine and keyboard. Perhaps the fun of this commercial is that it fools viewers that it was produced by the people in the ad. This is why you were advised not to take candy from a stranger. I’ve been avoiding this candy for the better part of two decades in fear that I would end up a banana head. This ad feels like the Parenting Council for Moms and Dads Against Candy (PCMDAC) had some influence over the concept. It’s not at all cool to eat fruit flavored candy and then turn into fruit. I’d guess the PCMDAC set out to make a commercial that would scare kids away from eating junk food. This plan, of course, backfired because everyone knows that if candy turns you into fruit, it’s only logical that fruit turns you into candy. The sad part is, if you remember this commercial, you’re now “them”. “Your gym teacher irons his underwear.” Twenty years later, you still can’t shake the association of gum and underpants. Personally, I was always a little horrified by the amputated feet at the end of the commercial. Fruit By The Foot would later rip-off the concept behind this gum and Fruit Roll-Ups. Also, if you’re wondering why the narrator sounds familiar, it’s because after the commercial break you heard him on Ren and Stimpy… and pretty much any other cartoon ever. Another example of mixed animation styles. This has been my favorite thirty seconds of advertising since it first aired. The catchy, yet dark, 80s synth jingle and unique blend of animation techniques officially warrants this ad the Soap In The Bathroom Best Commercial Ever Award. Unfortunately, Hershey would later decide to muck with the formula of many of their best candy bars. If you haven’t had a Whatchamacallit since the 2008 reformulation, just leave your good memories in the past and eat something else. They spared no expense in set design. Admit it, you were duped into drinking milk as a child in the false hopes that your muscles would get bigger, you’d find a date, and your head would turn into a balloon. I’m pretty sure that’s Tina Yothers of Family Ties fame in the first commercial. Did the milk thing work out for her? Did we miss some of your favorite memorable junk food commercials? Tell us about it in the comments below!